You are here: Home / Age of the Earth / The Salty Sea Part III: Are the Oceans Getting Saltier Over Time? The Salty Sea Part III: Are the Oceans Getting Saltier Over Time? The Salty Sea Part II: A Young Earth Salt Chronometer? Are the Oceans Actually Getting Saltier? In Part I and Part II of this series on the use of salt as a chronometer I presented some of the uses of this argument by YECs that the earth must be relatively young. We saw that the popular argument in the YEC literature states as a matter of fact that the oceans are getting saltier each year and then proceed to draw implications about the age of the earth given this fact. Austin and Humphrey’s paper The Sea’s Missing Salt: A Dilemma for evolutionists goes to great lengths to estimate the possible inputs of salts into the oceans and how much is being removed to show that there is an excess of salt entering the oceans each year. 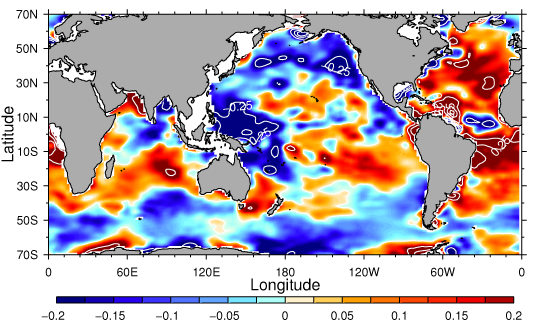 Although their paper is the primary source for the YEC claims they don’t actually provide direct evidence the oceans are getting saltier though it is certainly implied. I guess I took it for granted that there were some actual data backing up the main assertion that the seas are getting saltier. But I’ve searched for references and nowhere do I see a reference to any significant study with actual data demonstrating oceans are actually getting saltier over time. Really, I’m shocked, I just assumed they were at least correct about the observation that even makes their argument possible. If their estimates show more salt going in than coming out wouldn’t one expect that the actual data from the oceans would support their prediction? I’m surprised that I actually trusted the YEC literature at least to this point given their track record but it sounded reasonable to me when I first read about it. From what I’ve read so far the scientific literature is leading me to believe that this was never a well substantiated fact. I think what has happened here is that they have assumed that just because Haley and other until the early 1900s believed the ocean was getting saltier that they were safe to believe that they actually were but those authors never had actual measurements but were themselves inferring that the oceans must be getting saltier because of the measured salt inputs into the oceans. recently. For example, the figure to the right is from a paper earlier this year in Science (see references) that reviews data collected from 1950 to 2000 and concludes that some parts of the ocean have indeed increased their salinity over those years but there are many oceans for which the salinity decreased over the same period of time. It seems that on balance the salinity of the oceans is not changing much at all even though salinity is changing quickly in some locations. This is just looking at surface salinity. Salinity also changes with depth but I can find any quantitative evidence that total salinity of the oceans has increased in the past 50 years. This recent analysis directly refutes the conclusions of Austin and Humphreys and these conclusions are the ones that other YECs have based their claims. If the oceans. taken as a whole, are not actually getting saltier then extrapolation back to estimate the maximum age of the earth is a senseless task. This is why scientists today would say that knowledge of the salinity of the ocean tells us nothing of the age of the earth today. In effect this is just what Livingstone concluded in 1963 well before Austin and Humphreys even produced their work. Without going into much detail I want to explain that the first scientists to use salt as a chronometer used the very simply assumption that in the past the sea was not salty or had much less salt and then extrapolated back from an assumption that the seas were getting more salty. They could not measure the salinity of the sea with enough accuracy or in enough places to actually know if the sea where getting saltier or not. They also did not know about plate tectonics or have an appreciating for what today is understood to be greatly differing climates in the past that would have changed the amount of salt inputs and outputs tremendously rending the their simple calculations void. Scientists today know too much about the fates of salts and the geology of the world to believe that the ocean was ever free of salt or that massive amounts of salt can’t be removed from the sea resulting in lower salinity. In fact, geologists have amassed many sources of evidence that the oceans of the past were saltier than they are today and that we actually live in a time which is less salty that most of earth’s history (see figure below). For example, during large ice ages, huge amounts of water would have been trapped in ice causing the seas to shrink in volume but have a similar total amount of salt and so would have been much saltier than it is today but when all this water melted it brought water of lower salinity into the ocean decreasing its salinity. Today as glaciers and other ice bodies are melting the volumes of the ocean are increasing which explains the lower salinity in the northern latitudes over the past 50 years. Why YEC, claim that scientists MUST believe the ocean was less salty or that salt can’t be lost from the ocean at a greater rate in the past than it is today or that salinity can’t increase or decrease just boggles my mind. Just because some scientists in the past attempted to predict the age of the earth based on very crude estimates of salt deposition from rivers and measurements of the salt in the sea doesn’t mean that any person today should be bound to believe that their inability to recognize the more complex dynamics of salt, especially since they had no concept of plate tectonics. Sea salinity as estimated by sea water density for the past 18,000 years. C and D show that the density of sea water is estimated to have been much higher in the past than in the present. Higher density means higher salinity. These data run only up through the early 1990s and salinity has certainly dropped since then with the infusion of more glacial and sea ice melting in the past two decades. Figure from: Changes in surface salinity of the North Atlantic Ocean during the last deglaciation. Duplessy et al. 1992 Nature 358: 485-488. Let me provide just one example of how salt has been lost from the oceans in a non-linear fashion over time. Consider the Mediterranean Sea. Underneath nearly this entire sea today are thousands of feet of almost pure salt deposits. Where did this salt come from? Multiple sources of evidence suggest that the entire Mediterranean Sea dried down multiple times to a few small lakes similar to the Dead Sea. These dry downs were caused by the sea being cut off by from the Atlantic. Before the entire sea dried out the Atlantic Ocean water would have flowed into the Mediterranean Sea where it evaporated causing that Sea to become saltier and saltier (even today the Mediterranean is much saltier than the Atlantic Ocean. When cut off from a large source of water the sea would have shrunk. This mechanism effectively pulled millions of tons of salt out of the Atlantic Ocean. Once cut off all of this salt crystalized and fell to the bottom of the drying lake to form massive salt deposits. When the sea refilled from the Atlantic it buried this salt deposits effectively removing the salt from the environment. This has happened many times at many different locations across the earth removing salt from the sea each time. creation scientist won’t even consider these data because they don’t believe the Mediterranean could be more than 4000 year old and thus could not have contributed to the removal of salt from the Ocean. But this is a circular argument. They will say that there is no mechanism because they don’t believe a mechanism can exist because they assume the world is young but then they want use the salty sea as an apologetic argument proving the Bible correct. This map shows the major evaporative basins and sediments found below the Mediterranean Sea. There are thousands of feet of salts found in these locations which represent the deepest points in the sea. The Atlantic ocean does not have these types of sediments below them. These sediments look very similar to the thousands of feet of salt that is found below the Dead Sea which are clearly the result of salts precipitating from a closed basin sea. All of this salt was dissolved in sea water at some point in the past but is now removed by evaporation from the sea resulting in changes to the salinity of the seas over time. So, how did “not enough salt in the ocean” then become one of the top scientific reasons for believing the earth is young? Only by trusting the number crunching and logic of a very small number of individuals who themselves did not take into account all the known evidence at the time. Everyone after them had faith in that evidence and turned a blind eye to the many many people that have pointed out the errors in the data and logic of the argument. Now you have organizations like ICR, that have speakers like Dr. Jeanson who has no geology background giving talks to hundreds of people in which he is using sea salt argument as a prime example. He almost certainly hasn’t spent the couple of hours reading primary literature which I have and it is likely he hasn’t even read Austin and Humphreys paper but is just parroting the summaries of other YECs of that paper. For many the salty sea argument sounds great. It seems so intuitive when one is presented with only a simple set of data and a simple story and since that story fits so well into the young earth worldview there wouldn’t be any reason to question the source. In the last salty sea post I will examine one additional example of confirmation bias expressed in the views of a Christian education leader, Dr. Jay Wile, who wrote about salty oceans as one of his top 5 reasons for believing in a young earth. Duplessy et al. 1992. “Changes in surface salinity of the North Atlantic Ocean during the last deglaciation.” Nature 358: 485-488. L. Paul Knauth. “Temperature and salinity history of the Precambrian ocean: implications for the course of microbial evolution” Palaeogeography, Palaeoclimatology, Palaeoecology, Volume 219, Issues 1–2, 11 April 2005, Pages 53-69, ISSN 0031-0182, 10.1016/j.palaeo.2004.10.014. William W. Hay, Areg Migdisov, Alexander N. Balukhovsky, Christopher N. Wold, Sascha Flögel, Emanuel Söding, Evaporites and the salinity of the ocean during the Phanerozoic: Implications for climate, ocean circulation and life, Palaeogeography, Palaeoclimatology, Palaeoecology, Volume 240, Issues 1–2, 6 October 2006, Pages 3-46, ISSN 0031-0182, 10.1016/j.palaeo.2006.03.044. (http://www.sciencedirect.com/science/article/pii/S0031018206002483) This article shows estimates for the past for ocean salt showing that they all show higher salt in the past than in the present. For example see figure below from this paper showing estimated salinity of oceans over earth’s history. I don’t see it in your references, but the excellent out-of-print book “Science Held Hostage” by Van Till, Young, and Meninga (IVP, 1988) had an entire chapter devoted to the history of the “salty seas” argument. As I recall, the basic YEC error was simply that the they discount or mis-estimate the amount of salt leaving the seas. Thanks for your comment. Good reminder. I had forgotten about that discussion in that book. I don’t seem to have it in my collection right here but I own the book and have read it. Yes, they argued that the processes of how salt is removed were not acknowledged or miscalculated. That link to Austin and Humphrey’s paper includes their “rebuttal” to Van Till et al’s claims but they seem to miss the point and do not address all of the concerns. Most importantly the process of salt removal is not a constant as if the same amount were being removed at all times but rather is a stochastic process through time (eg. not uniform1) and thus an appreciation for historical processes is required to get a grasp on total salts extracted from the ocean. Interestingly, YECs believe in a recent ice age and so really they should have assumed that the salinity of the ocean should be going down because the oceans should have been very very salty after the flood when most of the water on earth was bound up in ice. I was also looking into this argument. During the course of this I did some back of the envelope calculations which suggested that the amount of salt present in the ground is too much to have been deposited during a single flood. Adam, I had intended to say something about this but it was too much for the article. The irony of the YEC argument is that they actually need there to be a mechanism by which massive amounts of salt can be removed from the water column very quickly to account for the massive salt deposits found in the geological column. They can’t use evaporation as cause so they are left with some sort of heated super saturated salt solution that extrudes salt deposits. Really, they believe that much of the water in the flood was super saline and even if much of the salt somehow was crystallized during the flood year the YEC ice age that followed the flood would have concentrated the salt in the sea to levels much higher today. So they need salt to be higher in the past than in the present but will claim that evolutionists uniformitarianism requires that the sea be less salty and getting saltier. Well there’s a part 4 for you! My calculations suggested that it would actually be impossible for the flood to have deposited because there is simply too much salt. The figures I got were something like >1200g of salt per 1000 grams of water. Of course, this is all based on guestimates from sources I found on the internets, so should be taken with a grain of salt (pun very deliberate). “One such marine deposit formed over the course of the Miocene contains 5.67 x 10^16 kg of sodium. Given the Miocene lasted about 17.5 million years you can work out that this means 3.24 x 10^9 Kg/yr was removed from the ocean. However, many creationists argue that geologic layers were deposited during the flood (I’m not sure what your stance on the issue is, so I’ll keep it generic for the time being). This means that the 5.67 x 10^16 kg of sodium from the Miocene deposit wouldn’t be deposited over the course of 17.5 my, but the single year the flood lasted. Which means, of course, that the flood would have to contain that much salt in order to deposit it and thus create these formations (either being inherently salty or picking it up from the land). Adam, I know Glenn from your citation. Always good analysis from him. Since he worked on those number much better estimates have been derived. If you have access the following is especially useful. http://www.sciencedirect.com/science/article/pii/S0031018206002483 Lots of numbers about halite deposits and the graph I added above. Any YEC that would spend the time to just ingest this one paper would realize the difficult position they are in. I do have one more post in the works but will keep it simply and just look at another rather outrageous use of the salty sea argument. === THE idea that the Mediterranean sea once dried up is a wild speculation there is NO scientific proof of that. The amount of salt getting in the ocean can be calculated very well. Sorry, I didn’t see this comment earlier. “wild speculation”? Nothing wild about it. Lots and lots of evidence. Yes, the amount of salt getting in to the ocean can be calculated but I’m not sure how that effects anything I’ve said.